Here is a great example of when waterproof or marine speakers are more than just for boats. 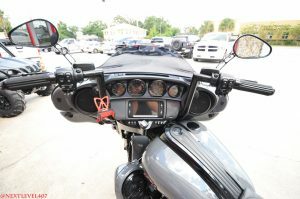 This Harley rider has seen some rain and wanted to have a loud stereo that would not be ruined on those days of getting wet. The customer came into our shop and got a first hand experience of what type of speakers were wanted. Our demo wall is meant to be used, and yes you can turn it up, that’s what it’s for. After spending time at the demo wall, WetSounds speakers were requested and cover plates were chosen. Compare all of our waterproof speakers side by side along with the hundreds of other different combinations of players and amps, and speakers.